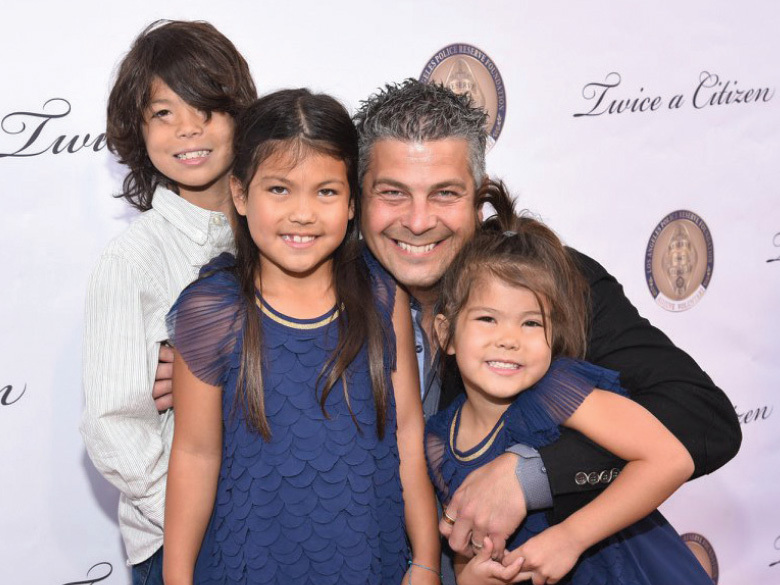 Reserve Officer Kenji Inaba was named Department Reserve Officer of the Year at the Twice a Citizen banquet. He is pictured receiving warm congratulations from Chief of Police Charlie Beck. Officer Inaba also received the honors for Rampart Area and Central Bureau. 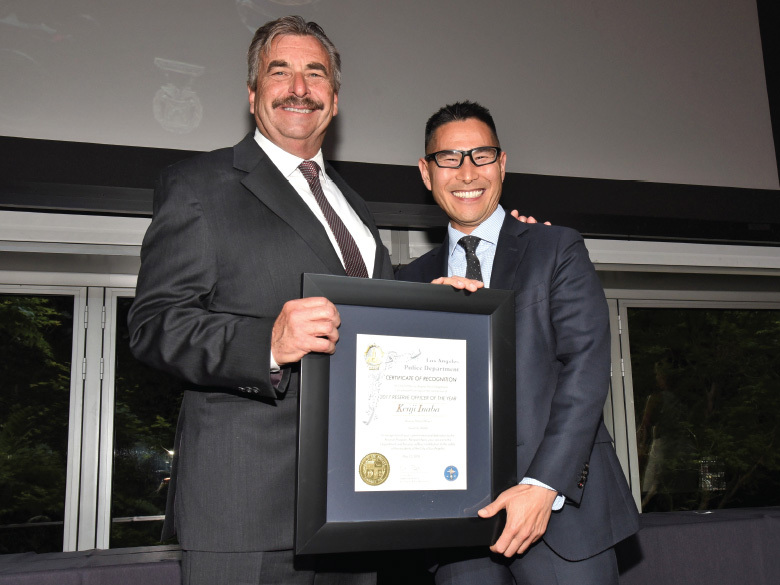 On May 12, as the California sun was setting above the Santa Monica Mountains, the annual Reserve Officer of the Year and Twice a Citizen banquet was underway. 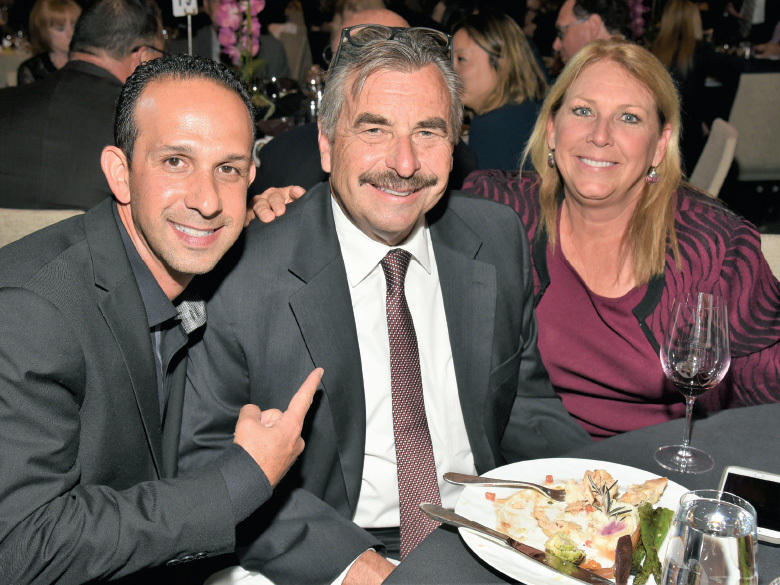 For the second year in a row, the banquet was held at the famed Skirball Cultural Center. As The Rotator was going to press, Officer Inaba was appointed to the Department’s newly established chief surgeon position. He will serve as the primary coordinator of emergency medical programs for officers injured in the line of duty and emergency medical and first-aid training programs for Department personnel. 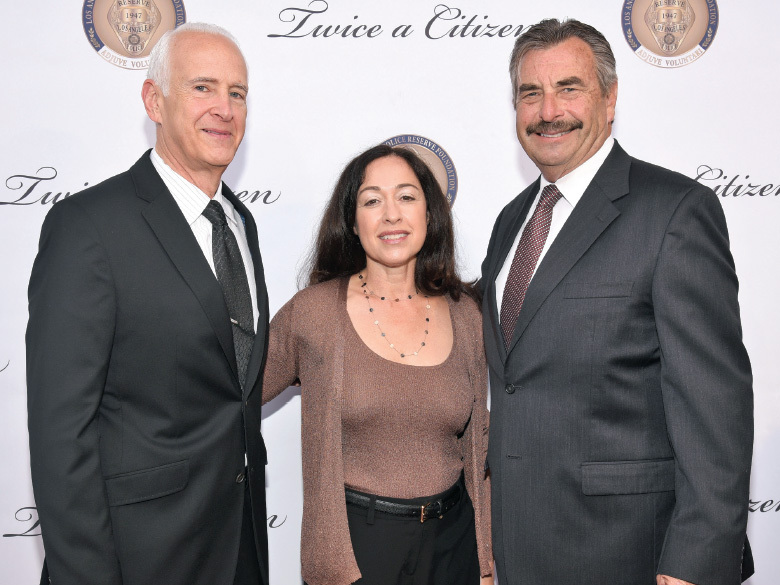 The other Bureau Reserve Officers of the Year honorees were: Joseph Saba (West Los Angeles) for West Bureau, Sharon Abbott (Harbor) for South Bureau and Roger Andrews (Mission) for Valley Bureau. 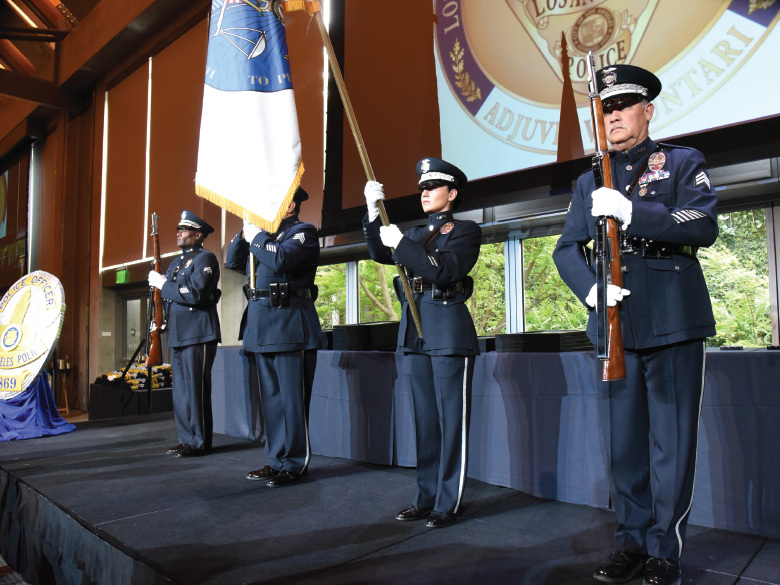 View their bios here and click here for the list of all reserve officers of the year. 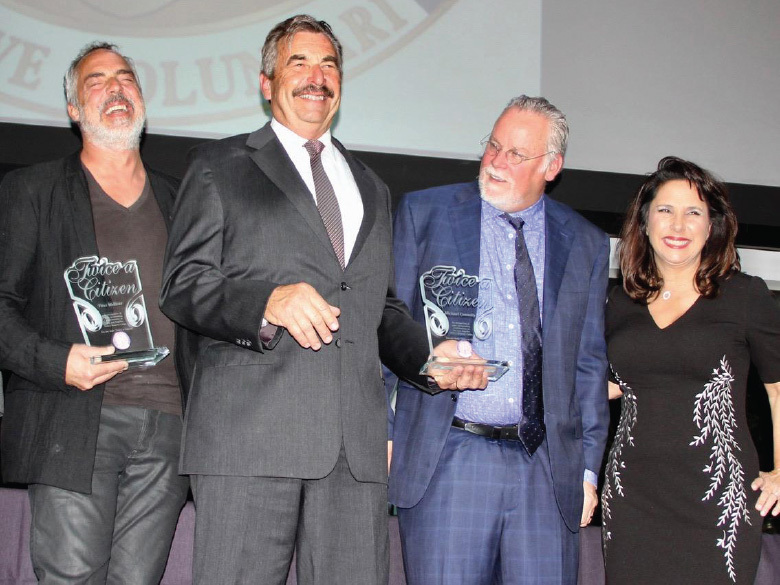 Four officers received their 50-year service pins: Jim Dellinger (Devonshire), Robert Kalstrom (Van Nuys), Frank Pettinato (TD) and Dennis Zine (GND). Click here to see the full list of service pins awarded. 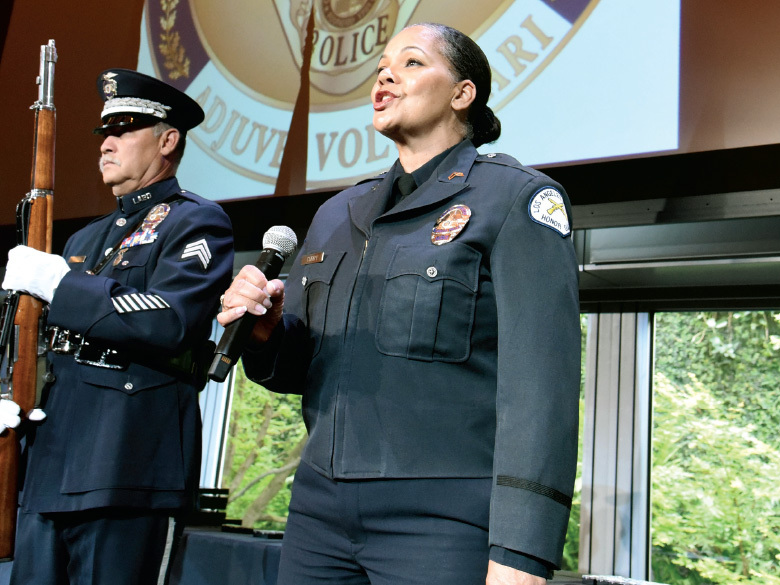 Following the presentation of colors by the LAPD Honor Guard, Officer Rosalind Curry’s singing of the national anthem and Father Michael Cooper’s invocation, hosts Bill Ahmanson and Kiki Haynes opened the evening at the Skirball’s Guerin Hall and greeted the 480 guests in attendance. 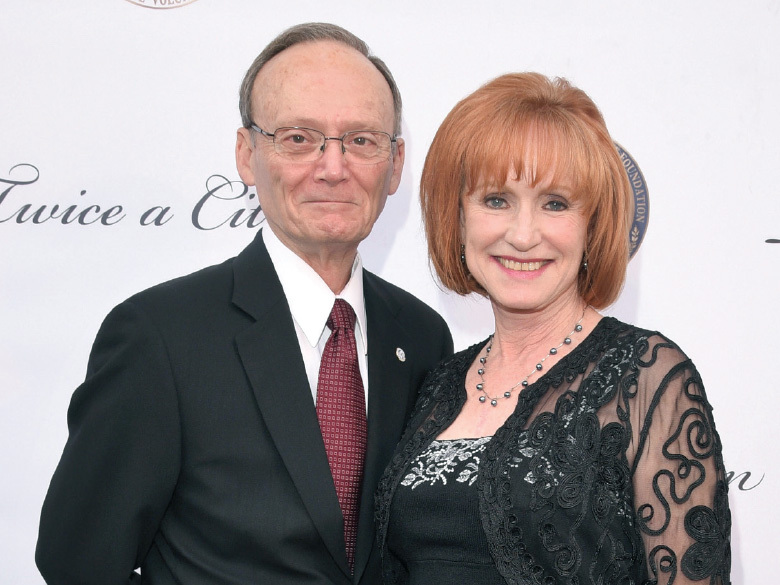 LAPRF Presidents Karla Ahmanson and Michael Sellars welcomed guests. Sellars said, “You are going to hear some amazing stories tonight — stories of service, dedication and courage. 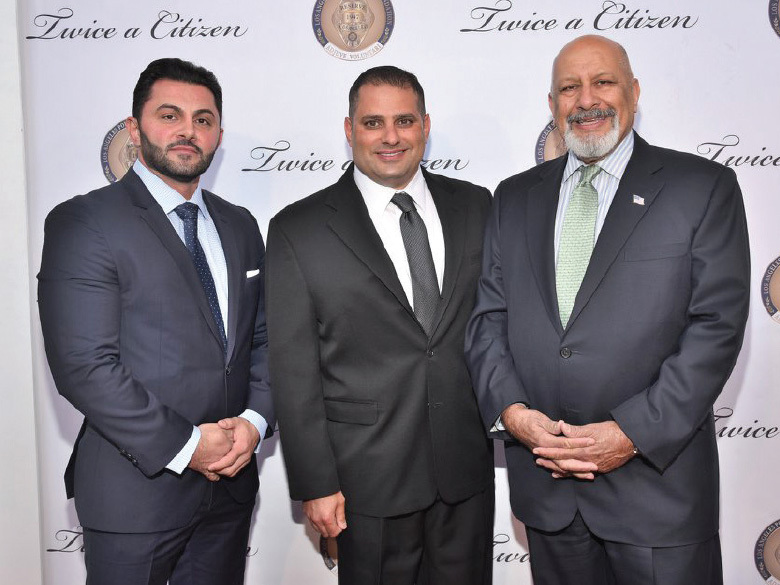 Take them home with you and share these stories.” He named the members of the Corps, both active and retired, who have passed away this past year: Steven Simona, Andre Dawson, Eddie Kafafian and Mickey Jones. This was Chief of Police Charlie Beck’s last Reserve Officer of the Year banquet. At the time of this writing, he is scheduled to retire from the Department in June 2018. 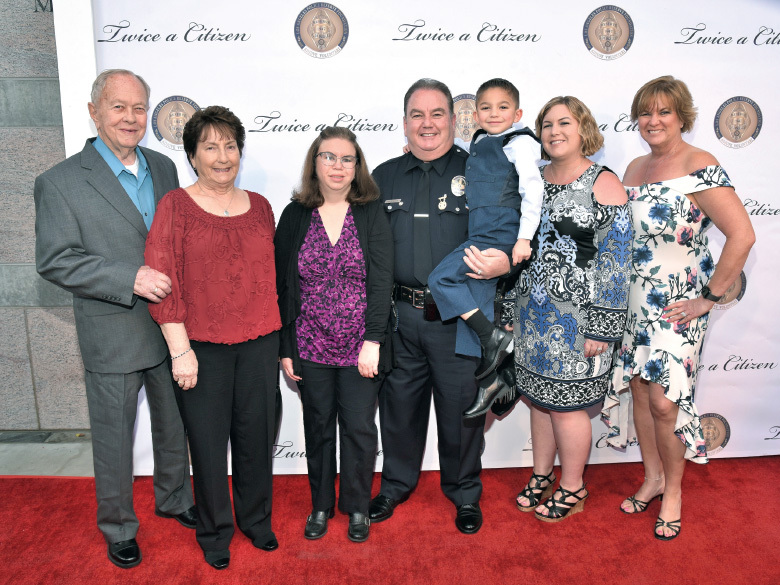 Chief Beck has served 45 years with the Department, beginning his law enforcement career as an LAPD reserve officer in 1975 and going full-time in March 1977. At the banquet, he was presented with his original reserve officer badge, encased in Lucite. 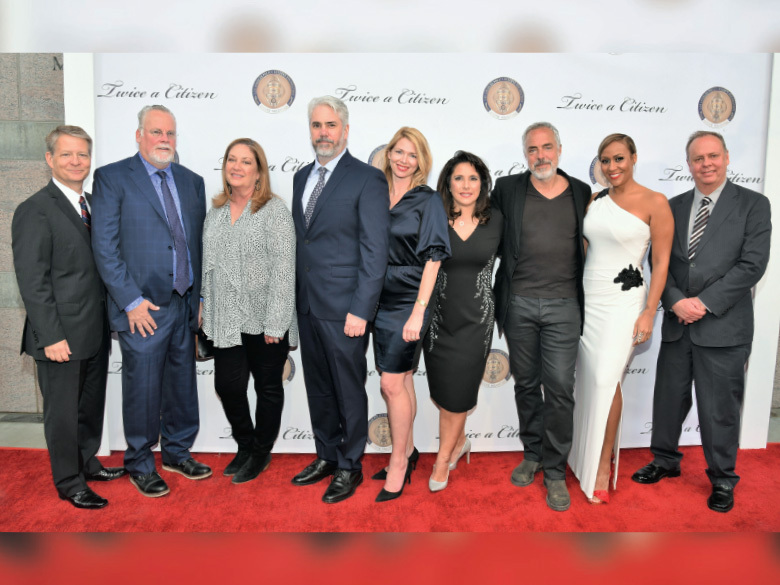 The Twice a Citizen honorees were Michael Connelly, the award-winning author and executive producer of Bosch, and Titus Welliver, the star of the Amazon series. In a New York Times review of the fourth season of the series, Mike Hale wrote: “…there’s no doubt which current series would score as most similar to the classic 1950s cop show Dragnet. 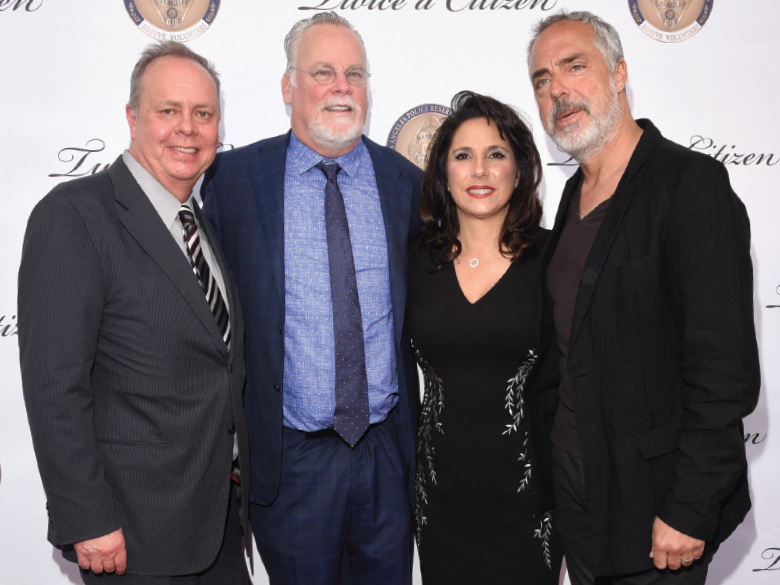 Detective Harry Bosch doesn’t actually say ‘This is the city: Los Angeles, California,’ but Bosch…is the spiritual heir to that granddaddy of laconic L.A. procedurals. 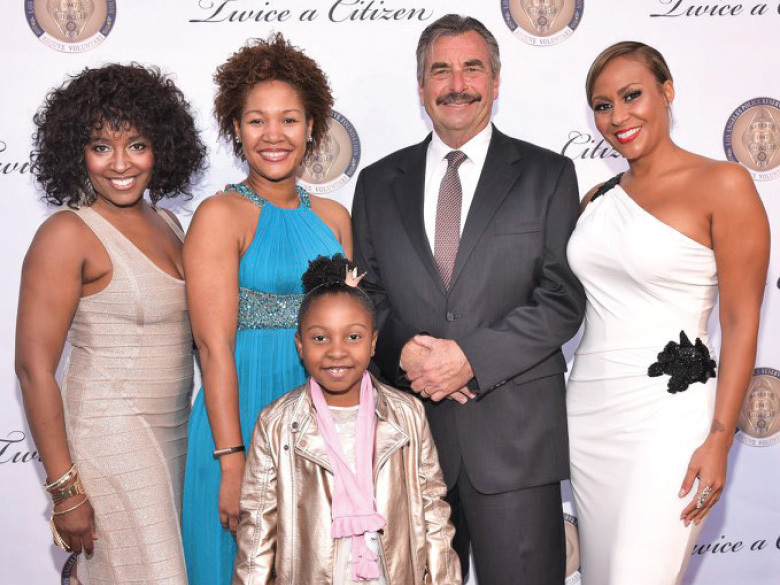 For the first time, a video was produced of the red carpet festivities, which included several interviews. 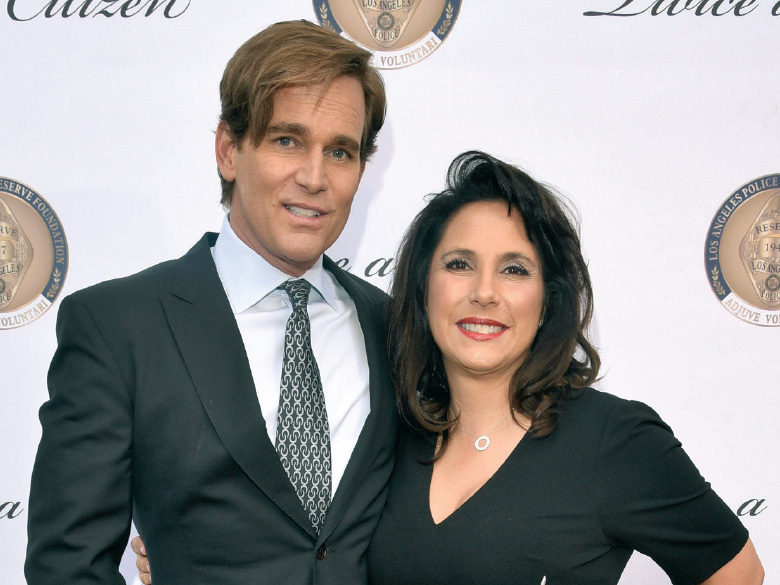 Michael Connelly said: “I’m getting an honor, but I’m really not the one who should be honored. 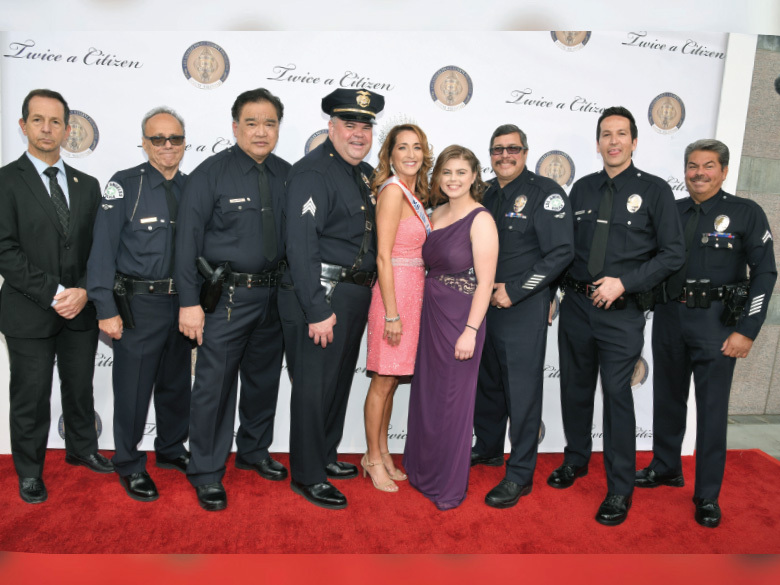 This is for the reserves of the Los Angeles Police Department. And talk about unsung heroes, these are people who I think make like 50 bucks a month to go out there and be in harms away. And that, to me, is the definition of a hero. “I spend a lot of time with cops, some of them are reserve, some not, and hopefully the bargain they make where they’re willing to do this even though it’s a very tough job, hopefully I get some of that by osmosis and I put it into my characters that I write about.” Connelly has written 31 novels, with over 60 million copies sold. Robert Glucroft, who recently retired from the Corps after 26 years of service, was presented with the Andrea Friedman Award. This award is given to those who go above and beyond in supporting the reserve program. Glucroft continues to serve as secretary of the LAPRF and joins Chief Beck and former Assistant Chief Sandy Jo MacArthur in having received this award. 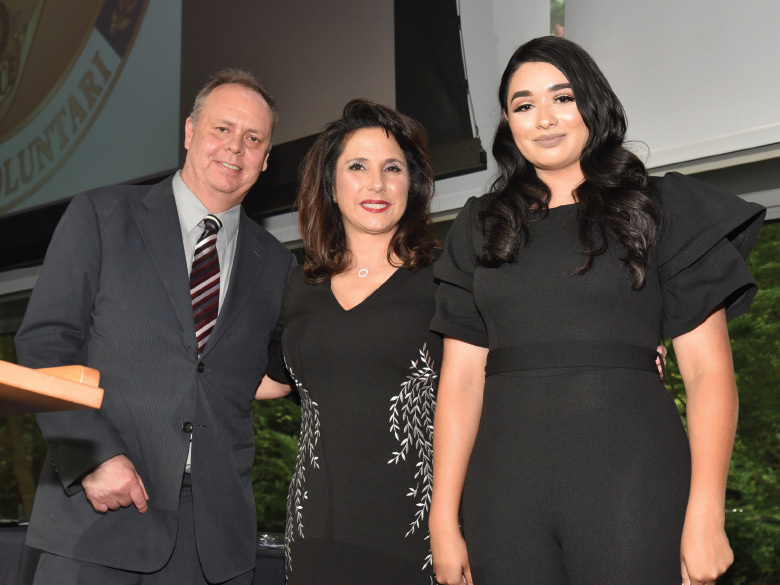 The winner of the 2018 LAPRF Emeritus Scholarship was Reserve Officer Karina Michelle Ardon of Olympic Area. 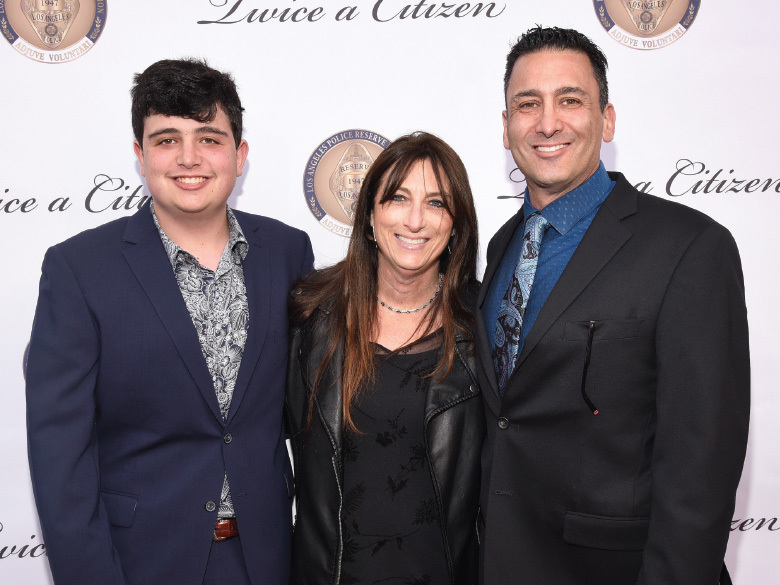 Officer Ardon is a former cadet commander and an LAPD POPP graduate. This is the second year that the scholarship has been presented. 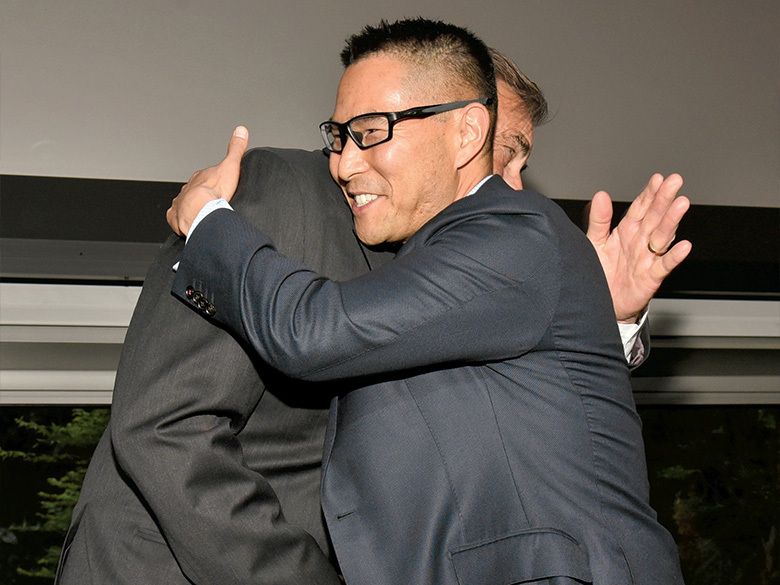 A door prize — a 50” smart TV — was given out to a lucky guest at the end of the night. Crystal Burke-Potts won on the third draw, beating out those who had already left. In December 2017, the Skirball Fire was “one of multiple wildfires that broke out across Southern California… The fire burned 422 acres of land on the slopes of the Sepulveda Pass… causing the closure of Interstate 405” (per Wikipedia). LAPD reserve officers were on scene around the city, working evacuations and other duties, in the smoke and in the ash, their uniforms due for a major dry cleaning that would easily swallow up their stipend. The LAPRF would like to thank all of the banquet donors and supporters, including the Ahmanson Foundation, Amazon Studios, Ambassador Frank and Kathy Baxter, Amy Aquino and Drew McCoy, Arsine Phillips and Amy Savagian, Councilmember Mitch Englander, Cynthia L. and the William E. Simon Jr. Foundation, Eddie Cunningham and NBC Universal, Elaine and Neil Simon, Paul Favero, Kathy Fergen and East West Bank, the Frandzel Family, Gary and Linda Goldfein, Ira Krinsky and Roberta Weintraub, Jane and Marc Nathanson, Jane Schroeder and Lenox Advisors, Inc., Jim Sarni and Payden & Rygel, John Moriarty and Associates, Judy and Tom Flesh, Latham and Watkins, LAPRA, LAPRAAC, Laura Dang and the Union Bank Foundation, Mark and Amanda Werts and American Rag Cie, Mark Deitch and 911MEDIA, Mark Hutchins and KPMG, Merle and Peter Mullin, Michael Yager and Banc of California, Midwest Wholesale Lighting, Paradigm Talent Agency, Patty Glaser and Sam Mudie, the Petersen Automotive Museum, Phillips Law Partners, LLP, Roger Andrews, Steve and Alice Yslas, Steve Fazio and Nicole Kluft, Supervisor Kathryn Barger, Trust Company of the West, and Vin and Erica Di Bona. Thanks to our auction donors, including Jean-Michel Cousteau Resorts, Fiji Airways, Chief Charlie Beck, LAPD Air Support, LAPD SWAT, Michael Connelly, Center Theatre Group, Universal Pictures, Bernard Khalili, Melvyn Kennedy, Make Rosson—California Supply, Jason of Beverly Hills and Tiffany & Co. Special thanks to Bernard Khalili and Rickey Gelb for our fabulous door prize, a 50” smart TV. 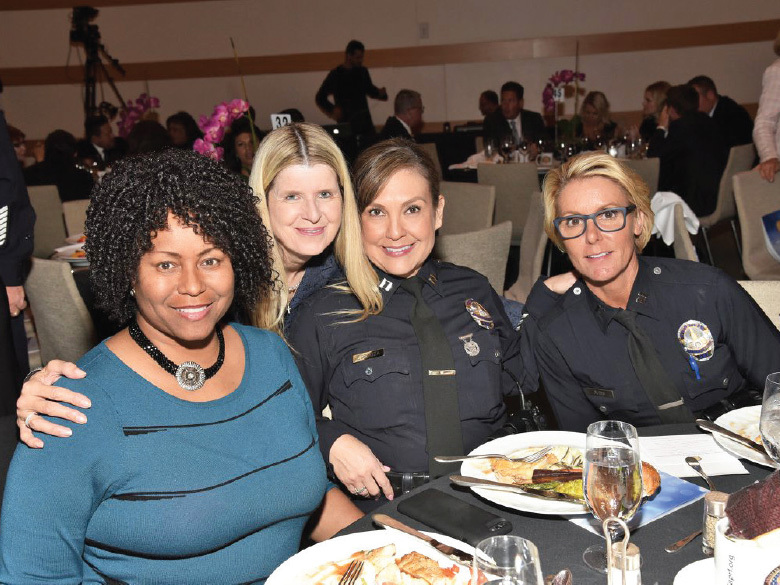 And a special thanks to Lieutenant Curtis McIntyre, Sergeant James Gaffney, Officer Johnny Gil and the Reserve Section team; the L.A. Vintage Coppers; Skirball Cultural Center — Uri Herschel, Founder/CEO, and Chris Porteous, Event Coordinator; Dave Gomez for the Chief’s message; Randy Bellous Productions, Intelliprompt, Tony Finetti and Mark Mardoyan; and all our volunteers. Editor’s note: LAPRF banquet photos can be viewed and downloaded at https://bit.ly/2JoXPEW. A photo album of select banquet photos can also be viewed on LAPRF’s Facebook page. If you have any questions, you can email msellars@laprf.org.